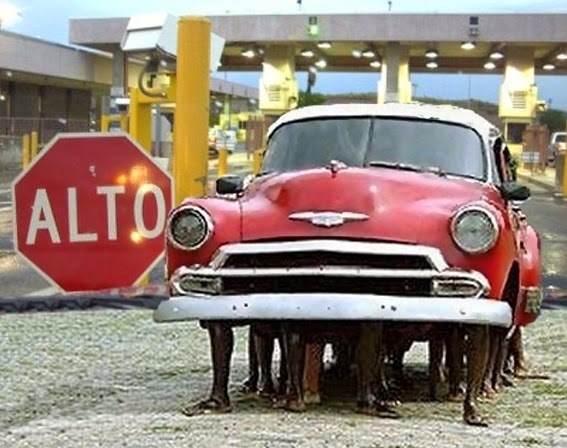 The United States Border Patrol is asking citizens to keep on the lookout for a red 1952 Chevy that they suspect is being used to smuggle illegal immigrants across the border from Mexico and into points along the U.S. border. If you see the vehicle pictured below and have reason to believe that it is the suspect vehicle, you are urged to contact your local Police Department or the U.S. Border Patrol. Hope a truck runs over it. Yeah, I saw it. It passed me up on the freeway the other day. Must have been doing 90.